One of my favorite things about living in Spain—apart from speaking Spanish, eating good food, and seeing layers of centuries-old history around me—is riding the train around the country. Although the network may not be nearly as comprehensive as France’s, for example, it reaches nearly all corners of the country, making it possible to explore Spain solely by public transportation. It’s super easy to take advantage of Spain’s extensive network of regional and long-distance trains, but it can be a little dizzying or confusing the first time you arrive if you don’t know what the heck you’re doing (hello, Trevor from 2012!). In this blog post I’d like to share nearly everything I know about Spanish trains, divided into the following categories: the main divisions of the network (e.g., commuter vs. cross-country), big stations and regional hubs, where you can cross into France and Portugal, the current state of the high-speed network, a breakdown of the various fares you can buy, how to actually buy a ticket, and customs while riding the train. Read on! 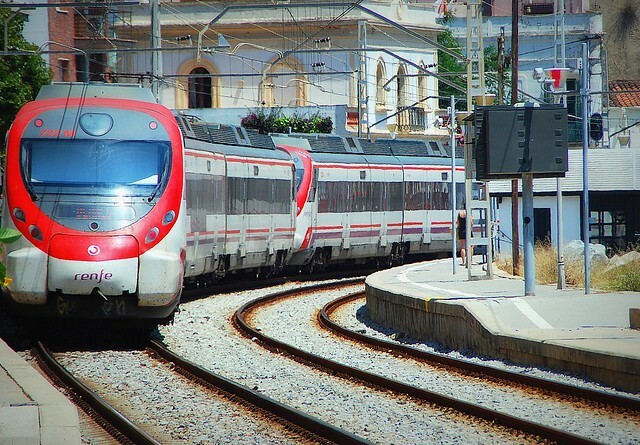 Cercanías: These are short distance or commuter rail that you can find in the biggest metropolitan areas like Madrid, Barcelona, Sevilla, and so on. They make few stops in the major city they’re named for but they continue far out into distant suburbs and surrounding villages. You can distinguish them by their red and purple design scheme. Also called Rodalies in the Barcelona area. Media Distancia: For regional “medium distance” trips you can take MD trains. Sometimes they travel within a single region (e.g., Galicia or Andalucía), but often they can go halfway across the country (e.g., from Madrid to Badajoz on the Portuguese border). Look for the orange and purple livery on the train cars. Also called Intercity and Regional in certain areas. The high-speed variant of MD is called Avant and works as a regional train service that runs on the high-speed rails. Larga Distancia: Literally “long distance,” these trains make cross-country hauls, often from Barcelona to Galicia or Alicante to Asturias. Spain’s half dozen or so night trains (trenhotel) fall into this category, as do all AVE high-speed trains that depart from Madrid. The Alvia train is a hybrid of normal- and high-speed service, and can hop on and off the high-speed tracks if a section of the journey hasn’t been completed yet. All long distance trains offer a cafeteria car for coffee, sandwiches, and snacks, and bear two purple stripes to distinguish them from MD or Cercanías trains. Feve: An minor player in the Spanish train network, Feve is a system of narrow-gauge rail that runs along northern coast (and in Murcia). A series of mountainous routes connects eastern Galicia with Asturias, Cantabria, and the Basque Country. Feve’s tiny train cars are usually painted blue and yellow. Madrid-Atocha: This is the major train station in Spain, a huge sprawling complex encompassing Metro, Cercanías, regional, and high-speed services. It can be a little disorienting until you realize that the turn-of-the-century wrought-iron hall isn’t actually a station but the old train platforms that were converted into a lobby and indoor garden. All the AVE trains depart from Atocha as well as all trains going to the south of the country (think Extremadura, Andalucía, etc.). Madrid-Chamartín: Far to the north of Madrid’s historic center is the Chamartín station, where you can catch the Metro, Cercanías trains, high-speed trains to Segovia nd Valladolid, and long-haul trains to the north of the country. If Atocha mainly serves destinations in southern Spain, then Chamartín is its counterpart for the north. Barcelona-Sants: The major terminal of the Catalan capital, Barcelona’s Sants station receives AVE as well as Metro and Rodalies traffic. From Sants you can now ride the French TGV high-speed train all the way to Paris’ Gare de Lyon thanks to the recently-opened line from Figueres to Perpignan. Barcelona-França: Although not connected to the AVE network, Barcelona’s other main train station is a grand Modernista structure covered by twin iron roofs, and historically sent off France-bound trains (hence the name). 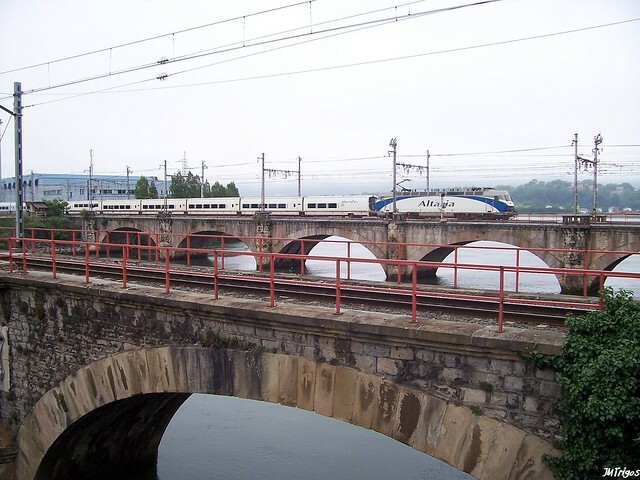 Ourense & Monforte de Lemos: Here in eastern Galicia these two stations are where the two halves of crazy-long trains meet up from A Coruña, Ferrol, or Vigo on their way to Madrid or Barcelona. Palencia & Valladolid: In the center of Spain’s sprawling north-central Castilla y León region, Venta de Baños (outside Palencia) is where most trains coming from Madrid-Chamartín branch off and continue on to Asturias, Cantabria, and the Basque Country. Near the regional capital of Valladolid at Medina del Campo, trains from Madrid head out to Galicia via Zamora. Miranda de Ebro: On the border between Burgos province and the Basque Country, Miranda de Ebro serves as the gateway to the Basque provinces as well as the crossing between the Madrid-Irún and Cantabrian-Mediterranean train lines. Alcázar de San Juan: This anonymous town in La Mancha is a major juncture for trains coming from El Levante (Valencia, Murcia, Almería) going to places like Madrid, Sevilla, and Granada. 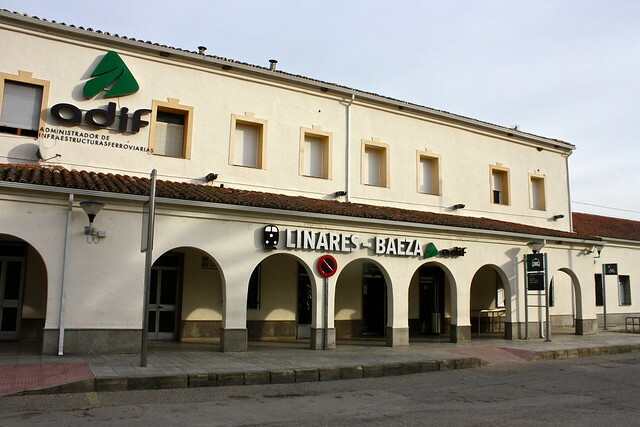 Linares-Baeza: Due to Andalucía’s mountainous borders, historically the station of Linares-Baeza was the only way in or out of the region by train. While the AVE bypasses Linares on its way to Córdoba, the city is still a major hub for normal-speed rail today. Figueres-Perpignan (France): You can take a high-speed train between Figueres in northern Catalunya to Perpignan in southern France. Irún-Hendaye (France): These two Basque cities on the Bay of Biscay are separated by merely a river, so while it is possible to simply walk across the bridge, it’s super easy to ride the train from Spain into France. Tui-Valença (Portugal): The two historic border towns of Tui (southern Galicia) and Valença (northern Portugal) sit on either side of the Miño River. The Vigo-Porto express train passes through here. Fuentes de Oroño-Vilar Formosa (Portugal): The Madrid-Lisbon night train makes an awkward arc north from Madrid before heading back down south into Portugal, crossing the border in western Salamanca province in a town called Fuentes de Oroño. Madrid-Andalucía: Spain’s AVE network was inaugurated in 1992 when the link between Madrid and Sevilla came on line. Today it also connects with Málaga (via Córdoba) on the Mediterranean coast. Future expansion: Huelva, Cádiz, and Granada. Madrid-Barcelona: In 2008—a decade and a half after high-speed rail first came to Spain—the AVE finally arrived in Barcelona, passing through the Aragonese capital of Zaragoza as well as Lleida and Tarragona along the way. 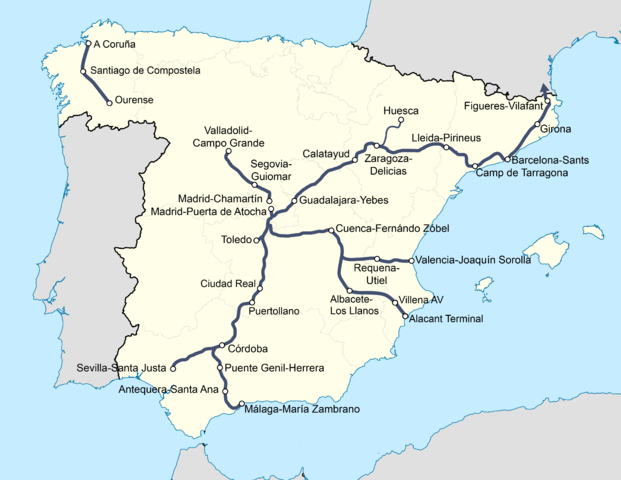 In Zaragoza a spur breaks off north to Huesca, and from Barcelona the line continues north to Girona, Figueres, and France. 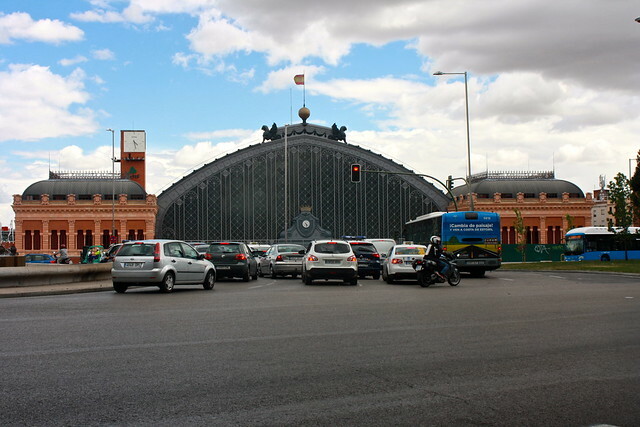 Madrid-Valencia: Linking the Mediterranean coast with Madrid and the flat plains of La Mancha, this AVE route connects Madrid, Valencia, and Alicante. Future expansion: Murcia, Cartagena, and Almería. Madrid-Castilla: Although it currently exists only in Media Distancia form, the high-speed service from Madrid-Chamartín heads north to Segovia and Valladolid in the center of the Castilian meseta or high plains. Future expansion: León and Asturias; Palencia, Burgos, and Cantabria. Madrid-Toledo: It’s nice that it only takes half an hour from Madrid-Atocha to get to the beautiful historic city of Toledo, but the only destination you can get to from Toledo’s train station is…Madrid. Madrid-Galicia: Somewhat awkwardly, the Madrid-Galicia high-speed link is partway done, but only in Galicia, which means the Galician section is somewhat stranded. Still, it does a fine job of bringing the far-flung cities of A Coruña, Santiago de Compostela, and Ourense together across extremely rugged terrain in a little over an hour. Future expansion: Zamora (Castilla); Vigo and Pontevedra (Galicia). 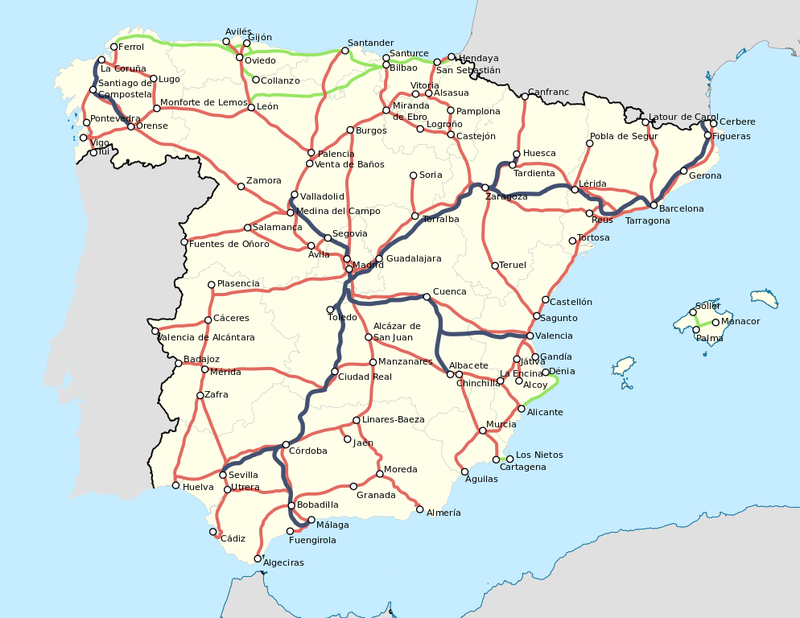 Future expansion: The “Basque Y” linking Bilbao, San Sebastián, and Vitoria-Gasteiz; and an Extremaduran network connecting Badajoz, Mérida, and Cáceres to Madrid. Flexible: Although you have to pay for the full cost of the ticket, you also get flexibility as there’s little to no cost to cancel or change your trip (and no problem if you happen to miss your train). Preferente: Essentially first class, but you gotta pay 20-30% extra. Ida y Vuelta: If you buy a round trip ticket you get 20% off your total fare. It’s also possible to do a compra múltiple and still get the there-and-back discount on a circuit journey between three cities (A > B > C > A). Promo: If you look online far enough in advance, you can find amazing steals with up to 70% discounts. I once took the train from Lugo in Galicia to Madrid for 16€, and from Santiago de Compostela to Barcelona for 20€. The risk with the Promo fare is that you can’t cancel or change your ticket. Promo+: Same as the Promo deal above, but it has up to a 65% discount off the standard fare and allows you to change or cancel your ticket for a small fee. Mesa: If you have a group of four people, you can buy a “table” of four seats and get a steep 60% discount. Because of this great deal, Spanish websites like Compartetren.com and Compartemesa.com have sprung up to act as a virtual bulletin board to see who is riding the AVE at the same time and to see if a group of strangers can buy an entire mesa together and split the cost. Carné Joven: If you have a European Youth Card (a.k.a., a carné joven) you can get an automatic discount of 20% regardless of the journey. Yippee! If the idea of speaking Spanish freaks you out, you can usually pay at computerized machines available in a variety of languages. Be aware that only chip-and-pin cards will work in these kiosks. 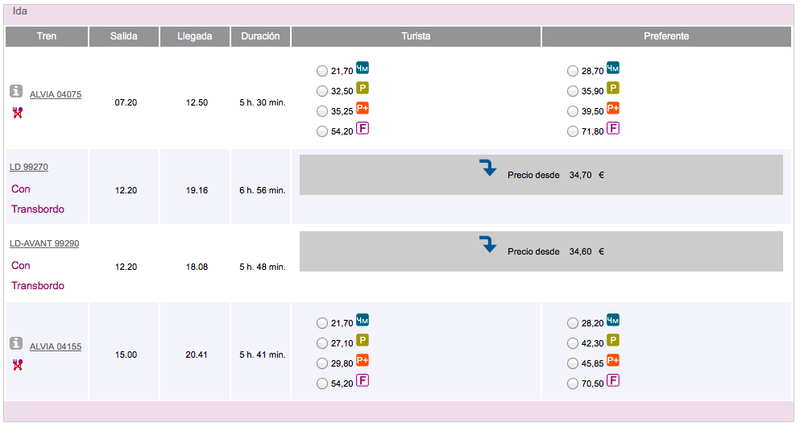 Another option is buying online at Renfe’s finnicky website. Filling out your personal and payment information is the hardest part; just try to accommodate your address into Spanish concepts of streets and residences, and cross your fingers that they’ll accept your credit card—sometimes it works and sometimes it doesn’t. If everything goes through, you can print your PDF ticket then and there, access it via your email, or have it sent to your iPhone’s PassBook app, for example. Finally, you can also take your confirmation code and print a physical copy of your ticket at any train station. Unlike France or Italy, there’s no need to “validate” your ticket in little yellow punch-boxes before boarding the train. If you have a ticket, you can just hop on and wait for the conductor to eventually make the rounds and verify your ticket. On certain long-distance trains, there may be a special cordoned-off access zone before boarding, and in Madrid I’ve had to pass my suitcases through a security scanner before the train departed. The vast majority of trains have assigned seating, with the number referring to the row and the letter referring to left or right window or aisle seat. However, some non-peak media distancia regional trains have free-for-all seating. 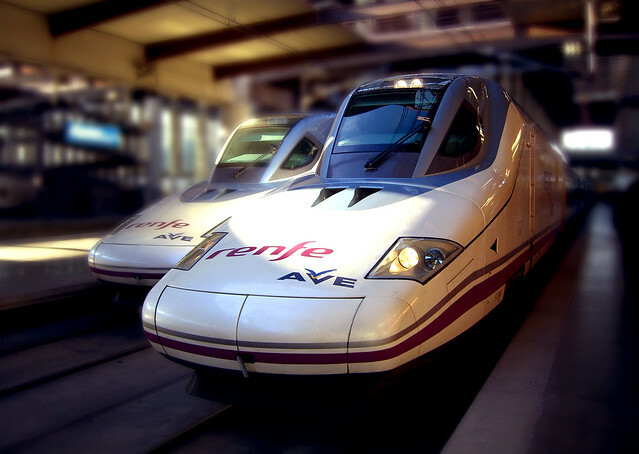 Have you ever ridden the train in Spain before? What tips or strategies would you offer? Comment below!